This very handsome brown brick apartment building is one of the most attractive in the Sutton Place area. The 15-story structure was erected in 1929 and converted to a cooperative in 1957. It has 96 apartments. The streetscape here is among the most elegant in the city. 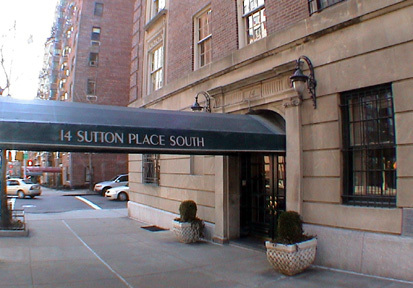 One Sutton Place, directly across from this building, is one of the most exclusive buildings in the city with its triple-arch driveway and the north side of 57th Street is a row of townhouses that share a large communal garden. A nice small park is at 57th Street and another one is a few blocks to the south on Sutton Place, both with fine East River views. The area is one of the most desirable residential enclaves in the city because of its many water vistas, its small parks, its quiet and its proximity to midtown. A westbound cross-town bus is available at 57th Street and Sutton Place. There are several restaurants nearby on First Avenue. The building has a canopied entrance with a doorman and a concierge. It has no garage, no health club and no sundeck.